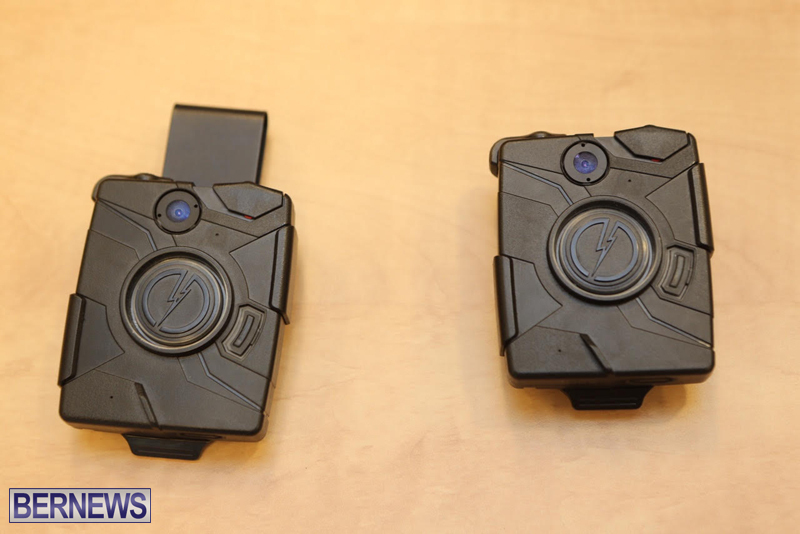 [Updated with video] The Bermuda Police Service is expanding their body-worn camera programme with AXON units that are fitted to the front of the officer’s body and captures a wide-angle, full colour view of what the officer is facing. A 30-second loop records continuously to provide early capture of an incident where it may take a few moments to activate the camera, and the video automatically uploads to a cloud-based storage system. The total cost for the cameras, docking stations, licence fees, warranty and evidence management, is $58,000, the police said. Acting Assistant Commissioner Darrin Simons said, “I am pleased to announce that the Bermuda Police Service is expanding our body-worn camera programme by introducing the AXON body camera and increasing the number of officers that are deployed with cameras. “The public will recall in 2010 when we introduced the TASER X26 Conducted Electrical Weapon [CEW], or “Taser” for short. 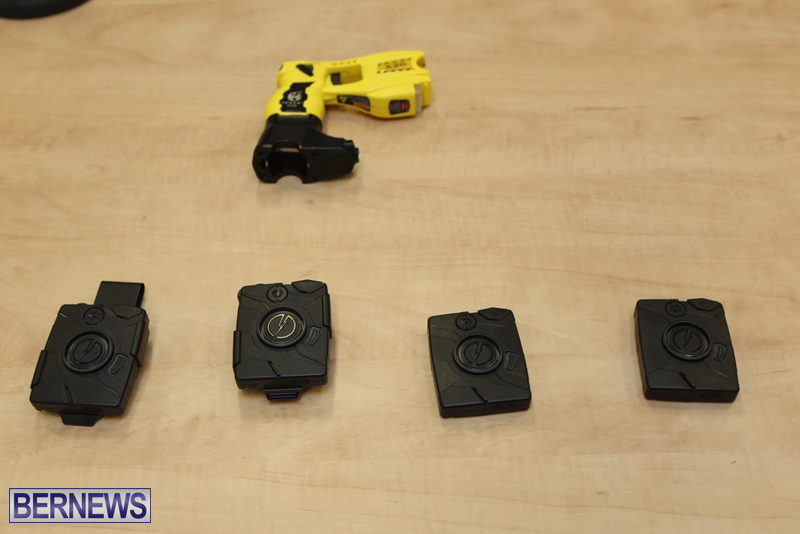 The Taser had a built-in digital camera that switched on whenever it was drawn from the holster and pointed towards a subject. “In 2012, our armed officers were issued with double-cartridge X2 Taser devices that did not incorporate a camera. The officers piloted different body-worn cameras, including the AXON FLEX that was fitted to the side of the officer’s eyewear. “The advantage of body-worn cameras over Taser cameras quickly became clear – video could be captured for any significant incidents that officers encountered, not just those for which a Taser was drawn. 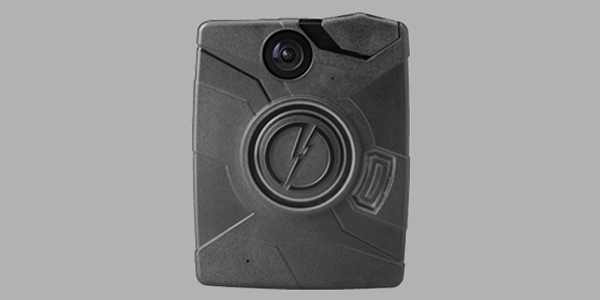 We have now moved to the Taser X26P, with no built-in camera. 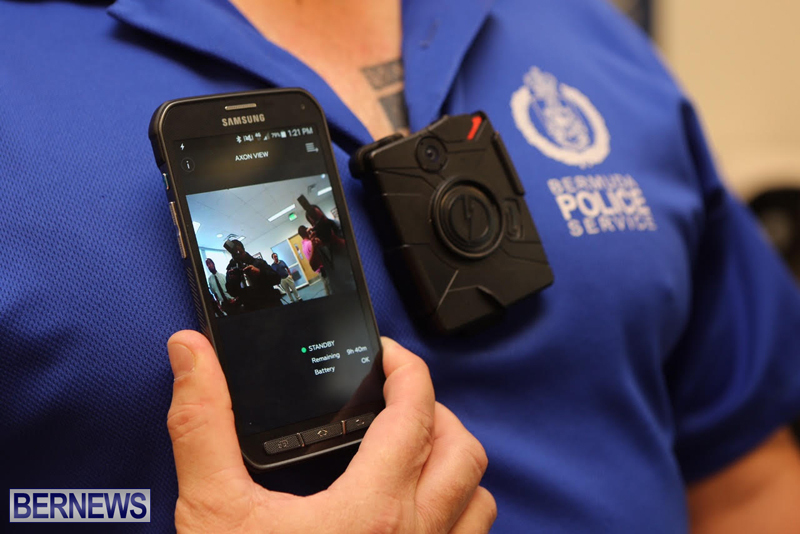 “The use of body-worn cameras by police in many jurisdictions has grown significantly in recent years and has been credited with improving the quality of evidence presented at court as well as reducing the number of complaints against police. “Our own experience with body-worn cameras has been a positive one. The presence of a camera has provided additional evidence towards solving a crime or has validated an officer’s account of an incident. We believe that cameras increase transparency, accountability and public confidence, and ultimately help to make the community safer. “The camera is fitted to the front of the officer’s body and captures a wide-angle, full colour view of what the officer is facing. The officer switches the camera on manually, but a 30-second loop records continuously to provide early capture of an incident where it may take a few moments to activate the camera. “The video automatically uploads via a docking station to a cloud-based storage and management system. The system secures the video evidence so that it cannot be tampered with and preserves the data for use at Court or for other enquiries. “By expanding the programme to include all operational patrol officers, we will increase the opportunities to gather video evidence of the daily incidents we deal with. We have purchased 117 camera units for deployment. Good, now Joe Public better be on their best behaviour around Boy Blue…(Smile, you’re on Candid Camera)…RIIIIGHT!! “Boy Blue…” better get it together. And the Police will think twice before they use unnecessary access force. Access force? Oh you are a sharp mind. Keep worrying about boy blue, they aren’t the problem the persons who feel they can do and say whatever they like are. There is no way I would want to be a police officer in a country where people are not accountable for their actions. No.1…you’re filming me so I hope you don’t mind me filming you. No.2…does this cam need to be activated as needed..? Because that would mean it can be deactivated just in case the they feel you need some licks first. No.3…ability to tamper with evidence which may not compliment the officers actions. No disrespect to ALL law enforcers…but they’re not ALL peaches n cream. Was I the only one who notice it said the cameras are manually operated, the new tasers do not have cameras built in….So what if the officer decides he will not turn it on or forgot to turn the camera on? Then what ??? Another gimmick sold and more evidence at crucial scenes lost because the officer forgot to turn on the camera and also 30 secs of lag time before it records. Well that how it appears to me . So explain this part —> “The officer switches the camera on manually, but a 30-second loop records continuously to provide early capture of an incident where it may take a few moments to activate the camera.” Is the camera in sleeper or dormant mode? I see it now, more and more of the general public will be doing their recordings too. This is an abomination of human privacy rights. The only reason it got allowed in America etc is due to the extreme terrorism and barbaric crimes that happen in excess there. Not here! Bermudians are so dumb and have no clue or connection to what is going on around them and have no clue about reality itself, and that is why Bermudians bend over backwards and let the Government and Police shove whatever they want, where they want, when they want! And I bet 99% of you out there have no clue reading this, and its meaningless to you. Well people like you don’t deserve a nation like my Bermuda. There are no attacks on police officers here, so why do they need body cams? You know why? So that when enough cameras are everywhere everything will be public and not private! NO PRIVACY! invasion of privacy! This is “Big Brother”, Orwell’s 1984, etc etc. It is not coming true, it has COME TRUE. WAKE UP! I’d say you are the tool…being used as needed then put away until you’re needed again. There ae no attacks on officers here? Really? I honestly have no problem with cameras that keep the officers honest too. I get your whole surveillance issue but you took it to the extreme there buddy. They turn on their camera, I turn on my gopro. So what? “bermudians are dumb, we dont deserve ur nation like bermuda”, i assume ur bermudian as well, so that makes you dumb too. If you havent noticed body cameras are used all around the world not just the USA. Bermuda is just catching up. Big brother is already in every avenue of your life, are you foolish enough to think that you had any privacy the minute you stepped outside your door. So the commissioner is crying out that there is not enough money to keep all the police officers but they can spend money on this. So how much are they going to have to spend to give all the police cell phones to see what is on the camera. They already have the phones, it’s just an app similar to the gopro app. Streams over wifi. typical ppl, always see the negative in everything law enforcement does to try and protect the every day citizen. They can use their own cellphones if they want to see what they are recording, its not a necessity, they cant edit or delete the footage. useing tax payers money for what? to recored what your looking at? whats the point? the bermuda police service tries anything to make it seem like their doing something… when we the community know that is all bs so before you spend the tax payers money on irellavant toys atleast let us know all the details and conditions as to why you the Bermuda police service think its alright to spend money on meaningless materialistic items…. in that case you shoulda have bought every officer a go pro and the new iphone.